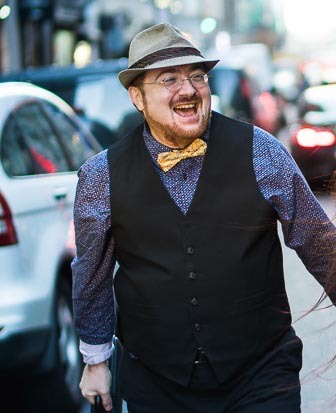 Zisl Slepovitch (Dmitri Zisl Slepovitch) is an internationally renowned multiinstrumentalist (clarinetist, saxophonist, flutist, pianist, keyboardist, singer), composer, arranger, translator, and music and Yiddish educator. Slepovitch is the founder and leader of the Litvakus klezmer band, Zisl Slepovitch Trio, Assistant Music Director / Music Director / Music Coordinator in many productions by the National Yiddish Theatre Folksbiene, including the Drama Desk Award nominated operetta The Golden Bride (2015/16) and Fiddler on the Roof in Yiddish directed by Joel Grey. Zisl Slepovitch has taught Yiddish language and culture The New School, served as educator and artist in residence at BIMA at Brandeis University, guest artist at University of Michigan, Indiana University, and Amherst College and Vassar College, a teaching fellow and performing artist at YIVO Institute for Jewish Research (New York City), Vienna Klezmer Workshop (Vienna), The Moscow Sefer Center, and Eshkolot Project (both in Moscow). Some of Slepovitch’s theater, film, and TV contributions include consulting and acting in Defiance (Paramount), Eternal Echoes (Sony Classical), Rejoice with Itzhak Perlman and Cantor Yitzchak Meir Helfgot (PBS), original scores for the documentary Funeral Season, children’s musical The King of Chelm, ballet Di Tsvey Brider, and many more. Zisl Slepovitch has performed/ recorded / collaborated / worked with / wrote for Itzhak Perlman, Joshua Bell, Ron Rifkin, Joel Grey, Edward Zwick, Michael Alpert, Zalmen Mlotek, Paul Brody, Psoy Korolenko, Frank London, Lipa Schmeltzer, Yale Strom, Lev “Ljova” Zhurbin, Cantor Yaakov “Yanky” Lemmer, and many others. Slepovitch brought over from his home country Belarus a rich ethnographic collection of Belarusian Jewish music folklore collected together with Dr. Nina Stepanskaya. The collection was used in Slepovitch’s his multimedia concert program Traveling the Yiddishland. Some of Yiddish poetry by Zisl Slepovitch has been set to music and published in Israel, Russia, and the US. Over the years, Jewish music and Yiddish culture have remained the core elements of his creative inspirations. Get the music by Zisl’s LITVAKUS’ klezmer band: Bandcamp (also as CDs), iTunes, Amazon MP3, CDBaby, and more!